The Canadian Standards Association (CSA) has introduced a new national guideline, CSA Z1006 Management of Work in Confined Spaces, aimed at better protecting confined space workers from injury – or even death. Regardless of the industry, all workers who work in confined spaces – from miners to wine-makers to welders, even rescue team members – should be well-versed in the potential dangers of confined space work, and educated on safe-work procedures in such environments. 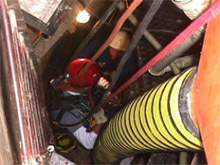 The term “confined space” refers to any workplace that fits any of the following descriptions: fully or partially enclosed; not designed (or intended) for continuous human occupancy; and/or has limited or restricted access, exiting or internal configuration that can complicate provisions of first aid, evacuation, rescue or other emergency response services. It must be noted that every “confined space” workplace is considered to hazardous unless otherwise determined by a competent person who completes a hazard identification and risk assessment process. The CSA is in particular concerned with the vast range of potential dangers for serious injuries (or even fatalities) amongst mine workers, grain silo workers and hydro vault workers. However, the CSA stresses that workers in various industries must work in confined spaces for their jobs, and are at risk from various hazards, including suffocation from noxious gases, lack of oxygen, electric shock, fire or falls. Even worse, once an incident has occurred, rescue team members are susceptible to the same dangers, becoming victims themselves – in fact, rescuers actually account for more than 60% of fatalities in confined-spaces accidents. As recent mining accidents (explosions) have shown, some confined space workers are not always as well-versed in safety practices and measures as they should be. A huge responsibility lies with management teams to devise appropriate confined space safety guidelines on which workers are thoroughly educated and tested on before they are allowed to begin working. As well, annual training refreshers should be provided whenever possible, to ensure continued retention of and compliance with such safe work procedures. Workers themselves must approach confined space work with a strong sense of caution, aware of all the potential hazards that such work presents, and take it upon themselves to become as educated and prepared as possible in order to adequately deal with any hazards that they may face. The CSA’s new standard (which is currently pending approval as a national standard in Canada) is aimed at helping managers, workers, and even rescuers to identify and recognize potential risks in confined spaces, and create relevant procedures to help prevent incidents and/or accidents. The CSA estimates that approximately 85% of confined space accidents could be prevented by implementing safety precautions outlined by the new standard.